Let us help you with your documentation. Bespoke HR can assist in the production of all HR-related company documentation including, but not limited to, employment contracts, company policies and procedures documentation, and staff handbooks. Of all the small to medium enterprises (SMEs) we represent, a staggering 45% did not have any form of documentation before partnering with Bespoke HR. Employment contracts are essential to all businesses, although few companies realise that it is a legal duty to provide an employee with a written statement of the main employment particulars within 2 months of a start date. Contract terms and conditions must also comply with legislation as well as being suitable to your business. A Bespoke HR Health Check revealed that a small company of twenty staff had no employment contracts or other company documentation. The Company Directors all had differing views on what was needed. Bespoke HR worked with the three Company Directors to establish what verbal employment terms and conditions were in place, and the current working practices with regards to company policy. A review was conducted to assess whether these policies were reflective of what the company was hoping to achieve. 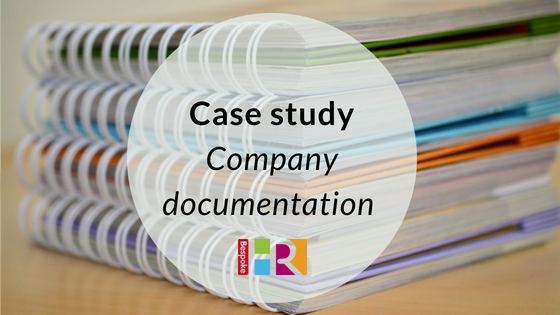 Bespoke HR then provided draft documentation that was legally compliant while also ensuring that only the necessary documentation is in place thus avoiding unnecessary ‘red tape’. A universal message and strategy was developed with the Directors to allow the company to move forward in a positive direction. Contracts, job descriptions, a company handbook, and an appraisal system were all implemented. Bespoke HR also met with employees to help them adapt their working practices to meet the needs of the business. The total cost was in the region of £6000. Find out more about how we can help with your company documentation.